I really enjoyed the book as I liked the author's choice of language and the blurb made me want to read it. In particular my favourite character was Marcus as he was always disappearing and getting into trouble. I also liked the history of the book and it felt like I was in that period in time and the author made me want to find out more about Romans. I would like to read more books by this author because I like this style of book. It was a very good book and I really enjoyed reading it. I loved the character Caradoc because he acts as though he's really strong and brave, however, when he was captured by the Romans, he was as fearsome as a plucked chicken in a stew pot! The place that I particularly liked was the tribe's men's village, it sounded fun, exciting and a place I'd want to go to. Although I wouldnâ€™t want to be there when the Romans attack it, otherwise I would find myself in heaven! I thought the book was very realistic to history, except at the end of the story when the Roman Empire lets Caradoc and some of the tribes men free. With my knowledge of history, I would have thought they would kill them or sell them as slaves. I rate this book 9 out of 10. If it had been longer withÂ more detail, particularly in the last chapter, I would have scored it 10 out of 10. This is a book in which there is a boy called Marcus who lived in a villa who is attempting to become a proper Roman. In the book Marcus's dad leaves him a man called Sabinus who starts training Marcus the qualities of being a Roman and what he needs to do. After a while I the book Sabinus dies due to being stabbed by Cardoc. Being 12, Marcus starts training himself to be a Roman and his friends also give a helping hand for him to grow into an apt Roman. A few months later Marcus sees his Father again while in a battle. I like the book because of the detail and description in when emphasising pain or joy. Also the words used in this book were very exciting. Furthermore the front cover looks very engrossing and makes you want to read the book. My favourite part in the book was when Marcus was able to see his father again and also they promise each other that Marcus will never tell anyone who his father is. The characters in this book were: Marcus, his father, Cardoc, Sabinus, Gwyn, Dragorix, Gable Arrius Crispus, Alwen and Cati. I would strongly recommend this book to 7 to 8 year olds because of the understandable yet adventurous vocabulary. Also the book is very interesting and captivating. I learnt that if you want to do something it won't come easily. Also practice makes perfect because the more you practice the better you get at it. Also I have learnt that Britain used to be called Britannia. Also the book provides a glossary for ancient place names and helps us learn new facts. 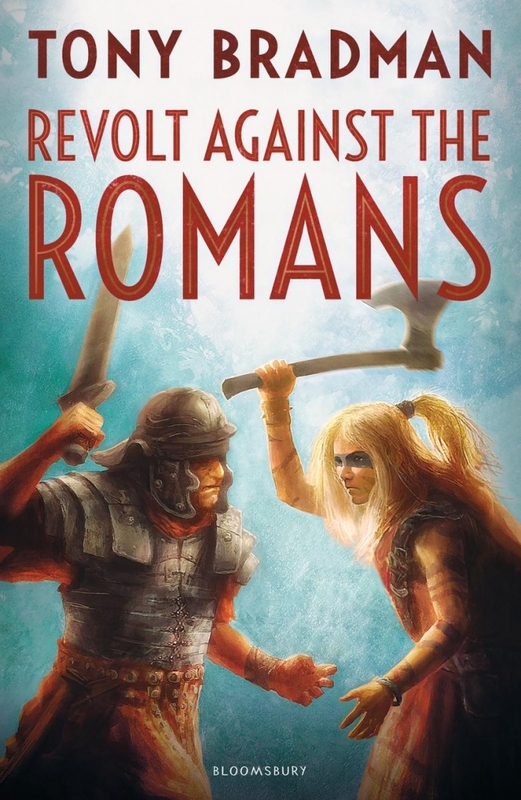 I think Revolt Against the Romans is an amazing book, with lots of suspense. My favourite character is Marcus because he is always involved in an exciting adventure. The history in this book was amazing, because I liked how Tony Bradman explained what life was like in Ancient Roman times. Every sentence was filled with interesting details. I am in love with Tony Bradmanâ€™s books and cannot wait to read the others. I bet they are just as fantastic. If you want to find out if the Romans beat the Ancient Britons in battle, and if Marcus survives being kidnapped, then read this book! I really enjoyed this book because it ties in with history that we have learnt at school so I understood what is happening. My favourite part of the book is when Caradoc gave a very touching speech to the emperor and that his life is spared because of it. I really want to find out more about this story and I think there should be a second book. I also loved how over time Marcus slowly blends in and becomes a Briton. I am not sure if I actually enjoyed this book or not. There wasn't really any special character which stood out to me or particular bit that I though was really good. However, I did think the history in the book was realistic and it did get me quite interested, so in the future I may find out some more information about the Romans. I really enjoyed this book. I liked the part where Marcus thought that he would get tortured but the Celts treated him nicely. The names in the book were a little strange but it was clever how it passed through time. I would like to read more books by this author. I found the book Revolt against the Romans really enjoyable to read and I would recommend this book to anyone who likes history. I liked Sabinus because he saved Marcus from getting killed by the Britons (Now called the Britains). I also liked Dragorix and Alwen as they adopted Marcus in Briton and Gwyn and Cati (Marcus's step brother and sister) were very nice to Marcus when they had to fight against the Romans Marcus and Gwyn stayed together all the time. Their tribe leader Caradoc was always kind and supportive when something went wrong. When they described Rome It seemed like a beautiful place with lots of villas and markets. It felt as if you were there, In Britannia guarding the Dun, seeing all of the warriors ride off either running at the Romans or charging at them on horseback. In the book, Marcus's real father, Gaius Arrius Crispus told Marcus to kill himself like Cato (his father thinks Cato is an excellent role model) but Marcus did not and he was determined to not give up, so he did not. Marcus's father soon went back to Rome, as he had been to Briton for something important. Marcus also had to go to Briton, but separately with Sabinus and a few other men. When he had to walk miles to see the warrior queen Cartimandua, he and his tube and also some of Cartimanduaâ€™s tribe are captured by the Romans, I found it scary and I didnâ€™t know what would happen. I would rate it 9/10 because it was really fun to read and it gave a full amount of description about most things. After reading this book I would definitely like to learn and read more about the Romans. I would really like to read more from this author as this book made you laugh, cry, smile and be angry. As I have learnt about the Romans before it just made you feel like it was giving you extra information, chapter after chapter. I wasn't really getting into it by the first few chapters but I soon got into it. I think it should be a 7+ book as chapter 2 is a bit gory. I liked the book because it was a very factual book with fictional characters. It taught me a lot more about the Romans when they were conquering Britannia. I learned a bit about the Romans' battle formation and how they made a defensive line with their shields to not let them be jabbed with spears. You also learned how the Britons dressed for battle and how they had no armour while fighting! I loved reading Revolt Against The Romans, it had lots of true facts, even though Marcus Arrius Crispus was a made up character in the story it felt like he was real. I like that at the started that Marcus was a Roman and when he needed to go to Britannia he was captured by the 'Catuvellauni' and that's how Marcus became a part of the 'Catuvellauni'. The author showed how different the Britannia families cared more for their children than the Roman families. In this book I learnt that the leader of the 'Catuvellauni' was Caradoc. At the back of the book there is a glossary of the towns and the cities, we needed that glossary as the book spoke about the Roman names, to recognise were they were talking about . I would like to find out more about the Romans. I would love to read more books by Tony Bradman, I think he is a really good author. I would recommend this book to my friends and family. I found the book exciting. I especially liked the part when Caradoc, Marcus, Gwgn and some of the army got captured because I was realy excited to hear what happened next. My favourite characters were Caradoc, Marcus and Gwyn, because they were brave and always prepared for anything that comes at them. I was angry at Gaius because he betrayed his son Marcus. I really enjoyed the book! My favourite character is Marcus because he is very brave, especially when he's with Gwyn , Awlen , Cata and Dragorix. I think that the history in this book is realistic because the detail that it uses sounds very believable . Yes , the book has made me want to find out more about history. The book also made me want to read more books by the author ( Tony Bradman ) because the story is very good. I would highly recommend this book to others!!!! This book is about the Romans, Britons, and a boy called Marcus. The Author, Tony Bradman, has shown what happened back in the days of Romans and Britons in a book so that children can learn what happened in the best way! My favourite character was the main character, Marcus who was a Roman Boy. When he was old enough, his father, Gaius Arrius Crispus, sent him to Britannia with some other Romans. Along the way, his group of romans got encountered by the Britons, and everybody but Marcus got killed! I think that this book is for ages 8 and over, because there are some nasty bits in this book, and under 8s wouldn't really understand it. Overall, I enjoyed this book so much that I could not put it down! I really liked learning about the Romans in this way rather than having just a fact book. It was good to have a main character too, Marcus. There were lots of interesting words and new things to learn about in the book. I think some of the things that happened might shock a young kid so it might be for 9 years and over. I really did like reading this book.